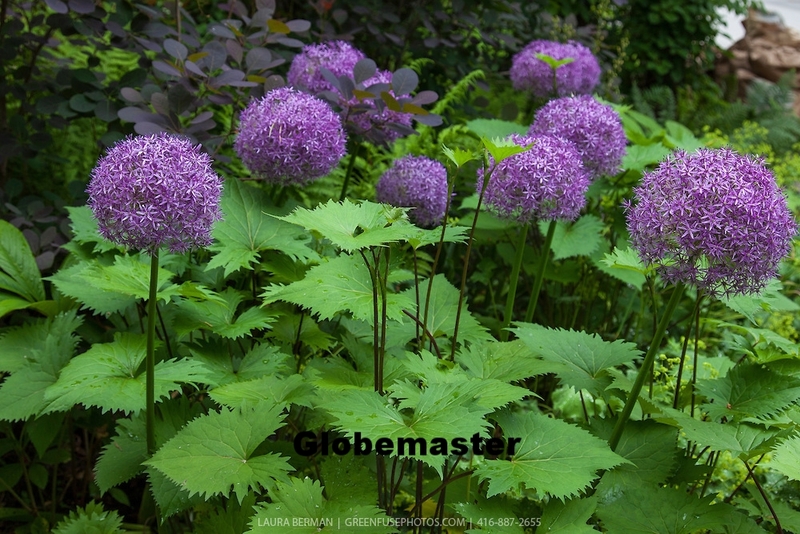 But, there is more to the allium family that the purple globes we are familiar with. There are now new colors and shapes to add to your gardens! You can now find allium in white, pink and even red! 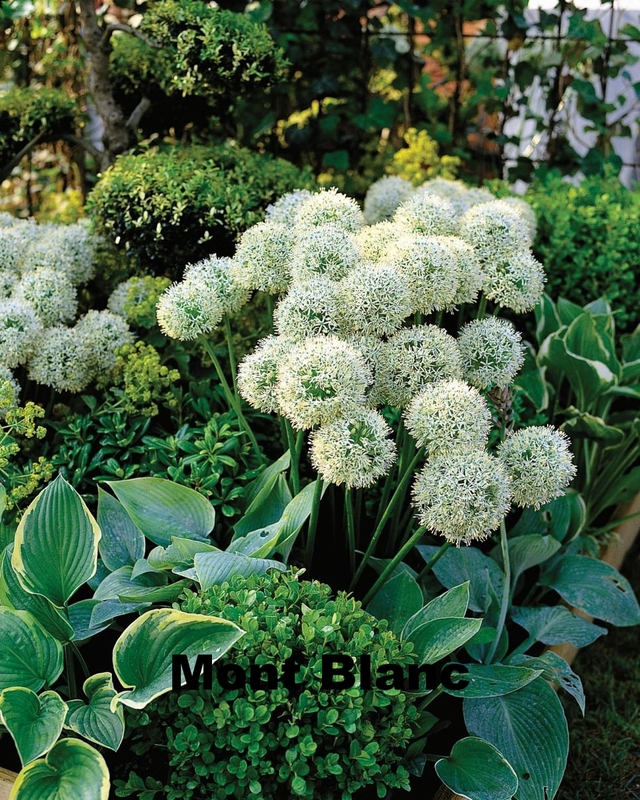 Cultivars such as Mont Blanc, Pink Jewel and atropurpureum add more options. And it isn't just about color - it is about shape and size, too! 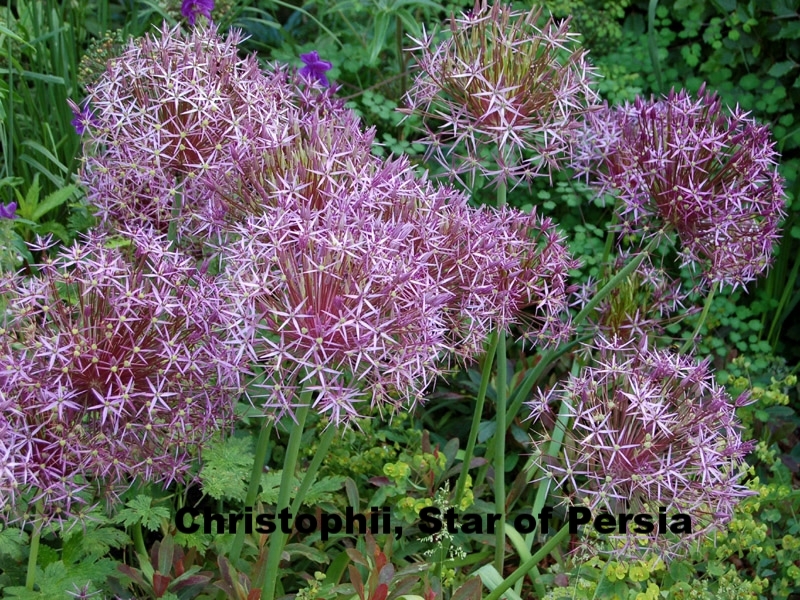 Bring a little 'wild and crazy' to the garden with varieties like Allium christophii, 'Hair', or Allium shubertii (perhaps the largest flower of all!). This is the time to shop for all of your spring bulbs and I encourage your to find spots in your garden for some of these hardy spring bulbs! Just like we go to the doctor for physical tests on a regular basis to maintain our body’s health, you should have your soil tested, too! Just like our bodies need a balance of vitamins, minerals and nutrients, your soils need 18 specific nutrients to promote a healthy environment for your lawn or gardens. Cost savings from only applying fertilizers and nutrients as needed. Level of organic matter, including phosphorus, potassium, calcium and magnesium. The report will also provide recommendations for supplemental nutrients for your specific area. With the right information, your lawns and gardens will thank you for the extra care! I encourage everyone to consider including local native plants in the landscape. 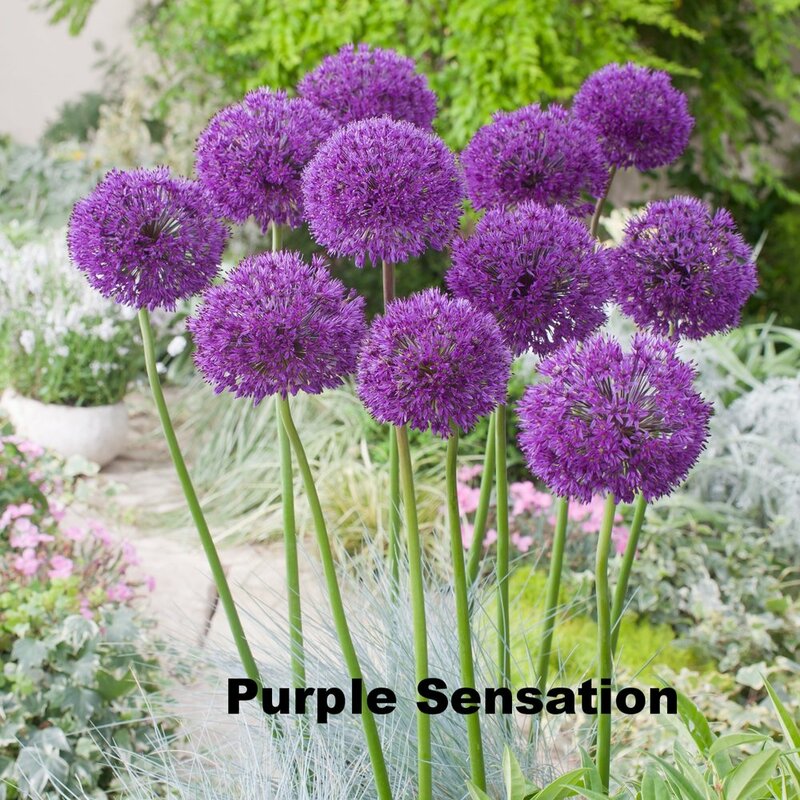 They offer so many advantages: save time and water with more tolerant plants, less fertilizer needed, and when winter approaches, less need for protection and barriers for these hardy plants. In addition to simplifying your work in the garden, adding natives can improve the quality of your soil, conserve water and better resist unwanted garden pests. I urge you to take a look at some of the ‘natives’ at your local nursery or garden center this holiday weekend and add some to your home’s gardens! This has been a really tough summer on our gardens, and this may be a new reality. I have seen many mature gardens lose stable trees, shrubs and perennials this year. It is important to water regularly, and to not count on a sprinkler system, especially for trees and shrubs. But, another idea to consider is to select more drought tolerant plants for your landscape. I found and article published in 2014 by the MSU Extension with some great tolerant suggestions. · Bottlebrush Buckeye (Aesculus parvifolia) is a tall multi-stem deciduous shrub with white bottle brush stems of flowers in the summer, even when planted in the shade! · Yarrow (Achillea spp.) is an easy to grow perennial with several different varieties, is a full sun plant, but drought and salt tolerant and not a favorite of the bunnies. For more suggestions I encourage you to visit the MSU Extension Service website for this and other great articles! I am always looking for something new or unexpected to add to the container gardens I create in June. This year, I encourage you to consider adding herbs to your floral container gardens. They offer unusual shapes or colors and many have lovely blooms of their own! For great upright interest, consider chives, rosemary or light and airy dill. For spilling over, think about thyme! There are several different types available with a variety of colors, like silver thyme and lemon thyme. Herbs to consider as fillers for your containers are mint, marjoram or parsley. 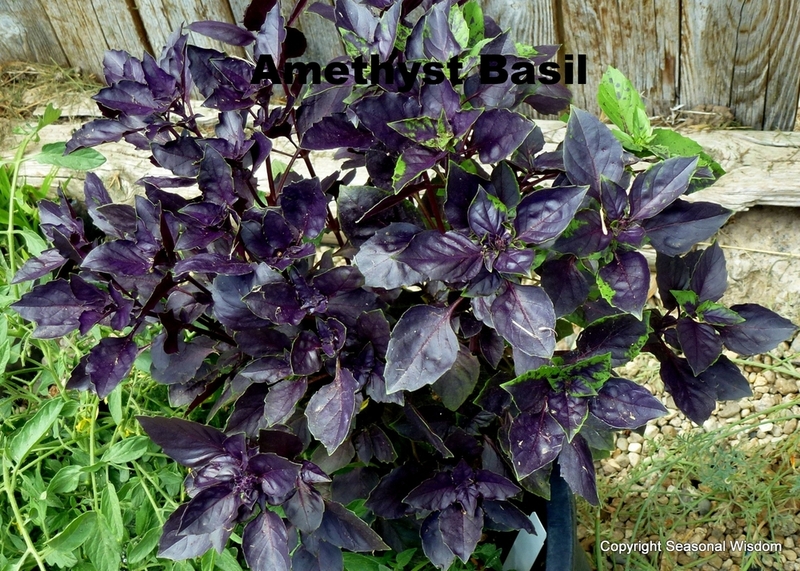 For unusual colors to add to your container gardens, think about purple basil or tri-color sage. And remember, if you have some basil in amongst your annuals in the porch container garden, is is easy to pick a couple leaves to have with tomatoes and mozzarella! Use pollinator-friendly plants in your landscape. Shrubs and trees such as dogwood, blueberry, cherry, plum, willow, and poplar provide pollen, nectar, or both, early in spring, when food is scarce. 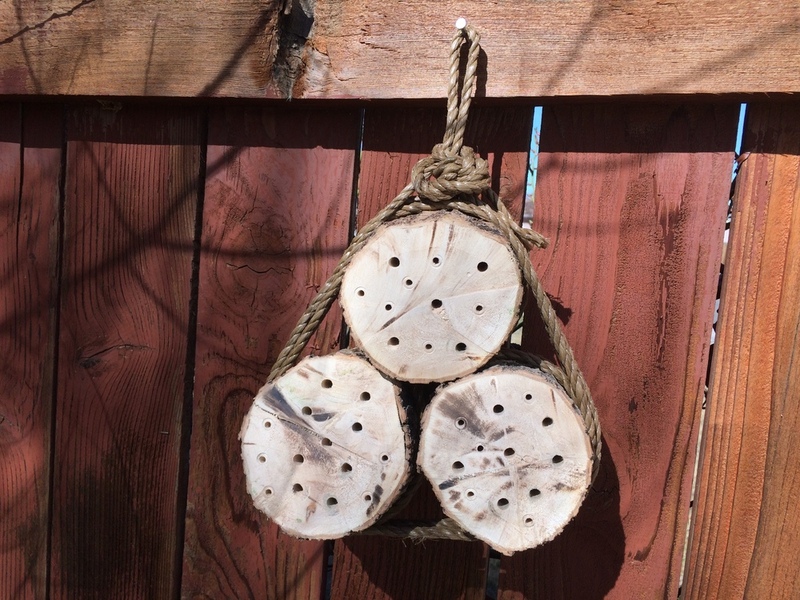 For an easy, fun project with kids, consider making a simple 'Bee Box' or 'Bee Hotel'! With a 12" block of untreated 4"X4" and a drill with a couple different diameter bits, you can make a perfect home for mason and other native bees. You can find instructions, a downloadable .pdf and even a YouTube video from the Chicago Botanic Garden. Once you are done with construction, mount the bee block on a protected south facing wall, tree or fence. After that, just a little annual care is needed to keep your small community of bees safe and happy in their new home. If you build this or another bee house (you can find lots of ideas online! ), be sure to let me know with a photo. I'd love to see our community come together to support our pollinators! You have given a special ‘mom’ in your life flowers, a spa visit, hugs and kisses, and now you are out of ideas. How about a Gift Certificate from A Southern Gardener? Would mom enjoy a one-on-one garden consultation with me? I love doing consultations (or what I like to think of as garden visits!) with gardeners and their gardens. Sometimes it is help to address a vexing problem like unhappy plants or how to address pests. Often, it is more about the proud gardener telling me about the space and their dreams for it than it is for me to offer ideas and suggestions. Our Gift Certificates aren’t just for consultations, though! 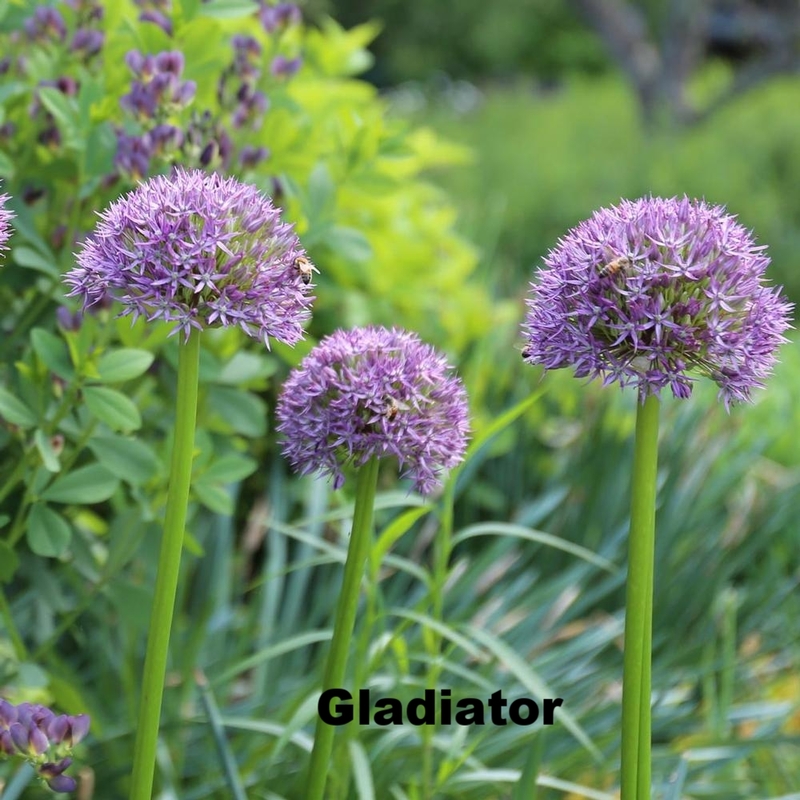 They can be applied to a beautiful new container garden. Maybe you have found a unique container that is perfect for mom and want to gift it with a certificate to have it planted. Or maybe there is a new garden that she would love to do.It can be a major change or just a renovation. Gift Certificates can be a perfect gift, applied to creating a custom design or more. We can create a specific one for any amount you choose. Is there a special event coming up this year and mom would like the yard spruced up? Make her life a little easier with a Gift Certificate towards a garden maintenance visit, another thoughtful way to help prepare for that graduation party or bridal shower in the back yard. If there is a special ‘mom’ (or grand-mom or aunt or sister!) in your life who is nurturing a family and a garden, planning an event, or deserves a blooming surprise, think about giving a customized Gift Certificate from A Southern Gardener! Call (313-881-2223) or email (Lynda@asoutherngardener.com) our office today! One of nature's most incredible displays is the annual migration of the monarch butterfly. Starting in September and October, eastern/northeastern populations migrate from southern Canada and the United States to overwintering sites in central Mexico where they arrive around November. They start the return trip in March, arriving around July. No individual butterfly completes the entire round trip; female monarchs lay eggs for the next generation during the northward migration with at least five generations involved in the annual cycle. However, with the loss of food sources and habitat, the monarch butterfly is at risk, with the number of migrating monarchs sinking to the lowest recorded population level in 2013–14, resulting in an imminent risk of failed migration. There is now a multi-national effort, from Canada to Mexico, to help the monarch recover, and we can help here in Michigan, right in our own gardens. Monarchs cannot survive without milkweed; their caterpillars only eat milkweed plants (Asclepias spp. ), and adult monarch butterflies need milkweed to lay their eggs. With shifting land management practices, we have lost much milkweed from the landscape. Please plant milkweed to support monarch populations! Planting milkweed is a great way to help other pollinators too, as the plants provide valuable nectar resources to a diverse population of bees and other butterflies. Adult monarchs will drink the nectar of many flowers in addition to milkweed, in fact, they need a variety or sources to nourish them throughout the growing season. Including a variety on native flowering species with different bloom times in your landscape will provide monarch the the food they need to reproduce in the spring and summer and to then migrate in the fall. Offering a wide variety of native nectar plants will attract monarchs and other butterflies and pollinators to you yard all season long! You can find out more about the efforts to help the monarchs, where to buy milkweed seeds and growing instructions through many non-profit organizations. Please visit the Save Our Monarchs Foundation, Monarch Watch, or the Michigan State Extension Service to find out how you can help! Colored bark shrubs, like red and yellow twig dogwood (Cornus) bring bright color to our winter landscapes. But the best showing by these ornamental shrubs comes with a late winter or early spring pruning. Here are some tips to help you prune these shrubs now to get the best impact next winter! Pruning now is easiest as the difference between old branches and new is more obvious. As the spring moves on and the shrubs leaf out, the bark becomes darker on all the stems, changing to a brown or red brown. Look your colorful dogwoods over now, pruning back grey, brown or black limbs now. These are the oldest parts of the shrub and will no longer give you the bright color you want next winter. Prune the oldest branches right to the base, only leaving 6-12”. If the shrubs have been neglected for a long time, limit the pruning to only 1/3 of the whole plant, so it can successfully regenerate. Stagger you pruning all around the shrub so new growth is balanced all around the plant. Using this process, the plant will be entirely rejuvenated in three years, be easier to maintain, and give you a colorful addition to your winter garden. Spring is definitely on its way and one of the first projects in the garden is pruning of ornamental trees and shrubs. Here are some basic suggestions to make the job easier and productive. 1. Have the proper tools for the jobs. This means an assortment of tools, including hand pruners, loppers, hand saw, and if you are pruning taller trees, as pole pruner. 2. Have your tools cleaned and sharpened before you begin! Trust me, this makes the job much easier on you and your plants! 3. Ask yourself “Why am I thinking of pruning this plant?” Is it really too big for the space? Is it crowding other plants? Make sure you are pruning for the right reasons. 4. Look at the natural shape of the plant and prune to maintain that habit. Don’t try to make that weeping cherry something it is not! 5. Finally, DON’T prune your spring bloomers right now. Leave those lilacs, forsythia, rhododendrons, fragrant viburnums and other spring bloomers alone until AFTER they bloom. You will make it easier on yourself if you allow your trees and shrubs to grow and develop naturally – you won’t have to prune as often and you will have more time to enjoy the beauty of these residents of your gardens. And if you are still unsure, just let me know any questions you have – I am always happy to help! I know you are all itching to get into your gardens and clean up the beds and prune your trees and shrubs. But, hold on a minute! Did you know you do not want to be in the beds when they are wet from melting snow and spring rains? By walking and working in a wet garden bed, you compact the soil tightly around the very plants you want to wake up and sprout. Compacted soil means compacted roots, roots that are just beginning to extend after a long winter. And if the roots cannot easily grow, neither will your plants. Your spring bulbs and perennials need the soft spring soils to make their return! If you must work in the garden when the soil is wet, or even just damp, use a small sheet of plywood (3/4" thick) or a wide board (2"x12") to walk and stand on. 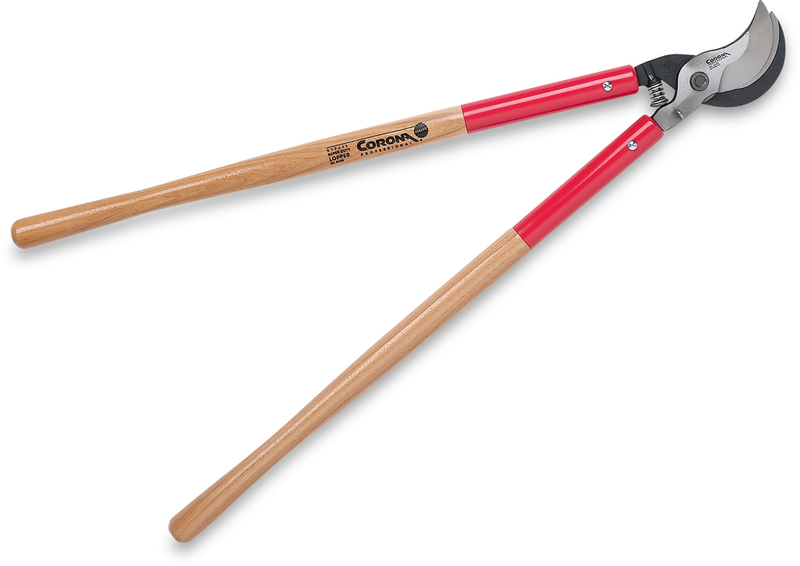 This will spread the weight avoiding compacting the soil around your trees, shrubs and perennials. Two of my favorite little friends are starting to peek out in my garden – Snow Drops and Winter Aconite. These are the first of the spring blooming bulbs to appear at the end of winter, the signal that spring is on the way! If you don’t have any of these beauties in your garden yet, here are some tips. I like to look around my garden at just this time of year to pick out the next place to plant these little gems. Look around your pathways and garden walkways right now, even take some pictures or mark some areas for the future. They can even be planted in the lawn, if you don’t treat the lawn with weed killer. 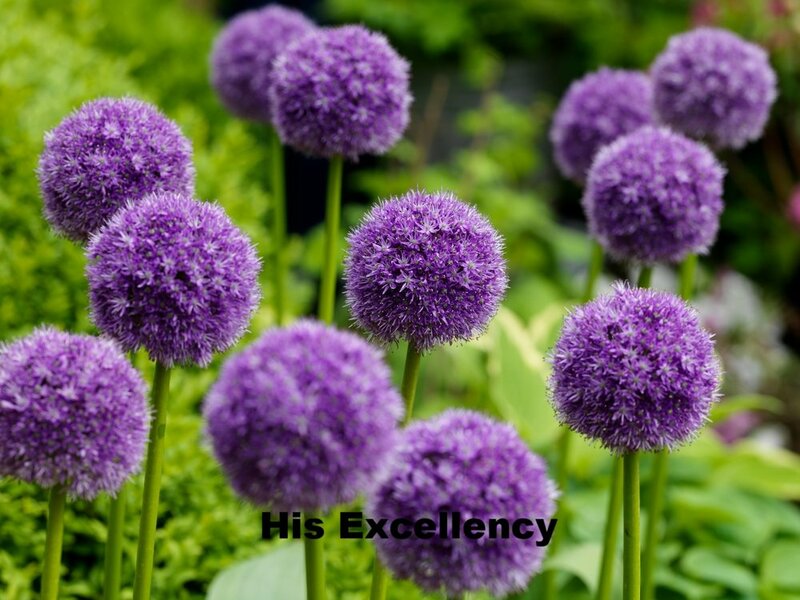 The bulbs are so tiny that you can easily plant them in among other bulbs or perennials. And, they are very tiny plants, so you will want to plant quite a few to make a visual impact. The nice thing is, though, that they happily spread over the years! 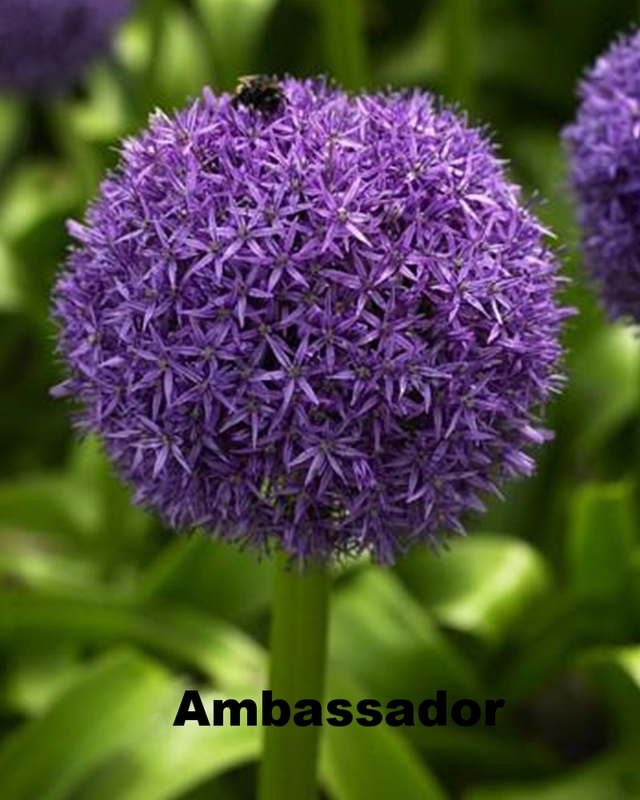 As they grow and multiply, you can also divide the bulbs after they are done blooming, called ‘planting in the green’. 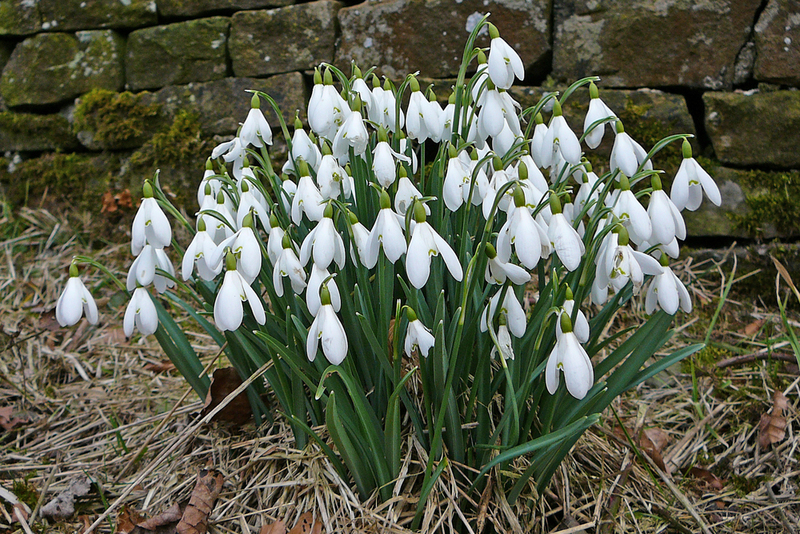 Just dig up a patch, separate the bulbs from one another and replant in more locations. Every garden deserves some of these early heralds of spring! How Are Your Houseplants Doing This Winter? Indoor plants are a lovely addition to any home and one way we gardeners can feed our gardening addiction during the winter months. But their needs change with the seasons, just like our outdoor landscaping. When was the last time you really looked over your houseplants? Proper watering is especially important in the winter. The heat is going and our homes are much drier, even if we have humidifiers. The trick is to not over or under water! Most houseplants are dormant now, and simply not using much water. A good 95% detest wet soil in winter, and should be allowed to dry out completely between watering. (The big exceptions to this rule of thumb are lemon, orange, grapefruit, other potted citrus; they REQUIRE a moist soil; do not let these few types dry out.) For smaller potted plants, the weight of the pot is the best way to judge; pick up your pots. If they feel very light, place them in a few inches of water in a sink or tub and allow them to soak it up through their drain holes until the pot feels heavy. Then let them drain in the dish rack, put them back in place and don't water again until the plant feels light once more. For those great big pots, use a long bamboo skewer. Drive it into the soil, then pull it out and check it for moistness. If the skewer is damp, no need to water - sort of like test a cake! Your plants also need humidity in the air around them, more than a home humidifier can provide. Place all of your houseplant in a slightly larger plant tray with a layer of pebbles in the bottom. Fill with water - this will evaporate into the air around your plants providing much needed additional humidity. Also very important during the winter is to NOT FEED your houseplants! Remember, they are dormant this time of year. They won’t be looking for any nutrition until the first of March, so no feeding! If your plants are looking long, lanky or weak (tempting you to feed them! ), it is most likely due to not enough sunlight. Don’t prune them back now; rather move them into a south or southwest window. Try to give them as much daylight as possible. Come the beginning of March your houseplants will begin to come out of their dormancy. The sun is stronger and longer, waking everyone up! This is the time for the first feeding and pruning of the year. Want more houseplant tips? Check out Lisa Steinkopf's suggestions at The Houseplant Guru. Of course, I am thrilled that you read and enjoy my blog here at A Southern Gardener. But, there are so many more online resources for information and ideas about plants and gardening and gardens. I enjoy looking up and reviewing new websites and blogs as I come across them. As you are relaxing this holiday season, if you find yourself with some quiet time to fill, I urge you to check out some of MY favorite garden blogs. First on my list is Gardenista. More than just a blog, this site is full of DIY ideas, great places to shop, tools and tips, destinations to plan in the next year. The site can seem overwhelming, but it is actually very well organized. And new things are posted all the time, and I mean all the time, throughout the day! This website alone will keep you engaged for hours. Another website on my ‘Do Not Miss’ list is Dirt Simple, a blog site by Deborah Silver, a landscape and garden designer whose firm, Deborah Silver and Co Inc., opened its doors here in the Metro Detroit area in 1986. Then, she opened Detroit Garden Works, a retail store in Sylvan Lake devoted to fine and unusual garden ornament and specialty plants, in 1996. She has been writing this journal style blog since April of 2009 and you can access all of her writings on the blog page. Another favorite resource is Garden Professors (you can also find them on Facebook). This is also a blog that has been around since 2009, featuring articles from multiple authors. The site is an informative website about the ‘science’ of gardening and the search tool is simple and straight forward. Their tag line is 'Advancing the science of gardening and other stuff since 2009', so don't feel it will be 'too technical' to read. It is packed full of valuable information and lovely photos. If you have a few moments this holiday season, look over these great websites, sign up for their newsletters or follow them on Facebook. You will have lots of inspiration come your way as we wait for the arrival of spring. Happy New Year from all of us at A Southern Gardener! Ground has broken! If you drive down Moross Road towards I-94, you can see much has been accomplished this fall. Starting several weeks ago, Backer Landscaping laid out the gardens, creating the new beds in the islands of Moross Road from Mack Avenue to I-94. The existing soil was supplemented and a temporary water efficient drip irrigation system was installed. Once the plantings are established, approximately 3-5 years, it will be turned off. There is variety of size and color, spring blooms and fall colors, and striking winter interest represented. There is even one of my favorites, the February blooming Witch Hazel. And the project isn’t done yet. Come this spring will be perennials in addition to the perennial grasses planted this fall. The Moross Greenway Project was formed over five years ago with the goal of raising $535,000 to beautify this major entryway to the Eastside. For more information or to donate, visit their website. For more details about this fall's progress, read this article from the Detroit Free Press. Do you have a gardener on your holiday gift list? Are you wondering what would be the perfect holiday gift for the ‘gardener who has everything’ or perhaps a gardening ‘newbie’? I’m delighted to provide a few suggestions to assist you! · Gloves, so many types for different garden chores, but don’t skimp on quality! I hope these ideas make your holiday gift giving just a bit easier! Some savvy green thumbs are discovering the same containers that hold vibrant annuals in summer can be put to brilliant use in the Yuletide season, creating winter arrangements that often last for several months. And for most gardeners, you may have all the materials you need right in your gardens! When considering your current containers, bear in mind the elements of winter. Not all containers will last winter weather extremes; plastic or terra-cotta pots will crack and shatter under the duress, so use wood, cast-iron, concrete, fiberglass or metal containers instead. But most important, do not use soil in the pot; it holds moisture and expands in freezing temperatures. Instead, use sand to anchor the pot and be sure to include drainage holes. Thriller Using tall boughs from shrubs with interesting texture or color creates vertical interest. Red twig dogwood, ‘Harry Lauder’s Walker’, and Curly Willow are great choices. Or use branches with colorful berries such as hawthorn, crabapple, holly, winterberry, viburnum and bittersweet. Spillers They’re invaluable in containers, spilling over the sides, masking the hard edges and creating the illusion that the pot does not confine the arrangement. Evergreens are an excellent choice, especially chamaecyparis, Norway spruce and low growing or weeping juniper. Select branches that will drape loosely over the exterior of the container. Fillers. Finally, complete your arrangements with other fresh evergreens, both needled and broad-leafed. Look around your gardens for holly, taxus, boxwood, barberry, and any other evergreens you have. And think about including dried hydrangea blooms, rose hips, pine cones, even nuts and other natural items. Want some ‘bling’ in your container? Use metallic spray paint on the Curly Willow branches or those hydrangea flowers. With some weather appropriate spray adhesive and glitter, pine cones and nuts will sparkle. Add some colorful weather resistant ornaments for holiday cheer. If you choose to collect materials from your garden, do so with care so as not to damage your plants or make unsightly pruning cuts that will cause you regrets in the spring. If you want to purchase greenery for the arrangement, most garden centers will have them available, or go to your local Farmers Market. If you are in the Detroit area, stop by the Christ Church Grosse Pointe Greens Sale on Saturday, December 5th for fresh cut Michigan greens (information is available at http://www.christchurchgp.org/give/gifts-greens-home). Design your container with a nice blend of textures and colors, cutting boughs at different lengths to create a natural feel. The arrangement should be relatively large in relation to the pot, with a minimum of equal parts pot and boughs, but more properly with a 1/3-pot-to-2/3-bough ratio. If the proportions are less, the pot will dominate and undermine the overall effect of the arrangement. With a little time and a nice pair of garden clippers, chances are you have almost everything right in your own gardens to create a beautiful, welcoming winter arrangement in some of your favorite garden container. Happy holidays from all of us at A Southern Gardener!